In October 2016, the new standard “IATF 16949:2016” was published. The first edition of the IATF 16949 has replaced and overrided ISO/TS 16949:2009. In this revision, adjustment has also been made to align with the latest version of the quality management ISO 9001:2015 standard. The corresponding “Rules for achieving and maintaining IATF recognition IATF 16949” were published in November 2016. Even before this revision took effect, adjustments affecting so-called extended production sites had been made to the current certification. Since 04/01/2016, it is once again possible to certify all connected sites with a single certification. Innovation, premium quality and the highest standards across the entire supply chain are crucial for success in the international automotive industry. A certified management system in accordance with IATF 16949 is a ticket to new markets and customers. The IATF 16949 is regarded as the world’s foremost quality standard for the automotive industry. It brings together a number of quality standards for car manufacturers and OEMs (original equipment manufacturers) in one certification process. Standards that prevailed before 1999, such as QS 9000 and VDA 6.x, have been largely replaced by ISO/TS 16949 and then by IATF 16949. As an automotive supplier, IATF 16949 will help you make continuous improvements to your system and process quality and place customer-specific requirements at the heart of what you do. establish a set of internationally recognized rules and avoid expensive multiple certifications. consistently follow-up on errors and increase the confidence and the security of your customers and partners. optimize your product and process quality and boost your chances on international markets. be able to use previously unavailable resources for other quality-related tasks. document your performance in a globally credible way. do the groundwork for meaningful combination audits , for instance, combination with ISO 14001 (environment) , ISO 50001 (energy) and ISO 27001 (IT) . reduce costs thanks to the standard’s focus on prevention and planning. Our experts will be more than happy to assist you should you have questions or require any further information on IATF 16949 certification. 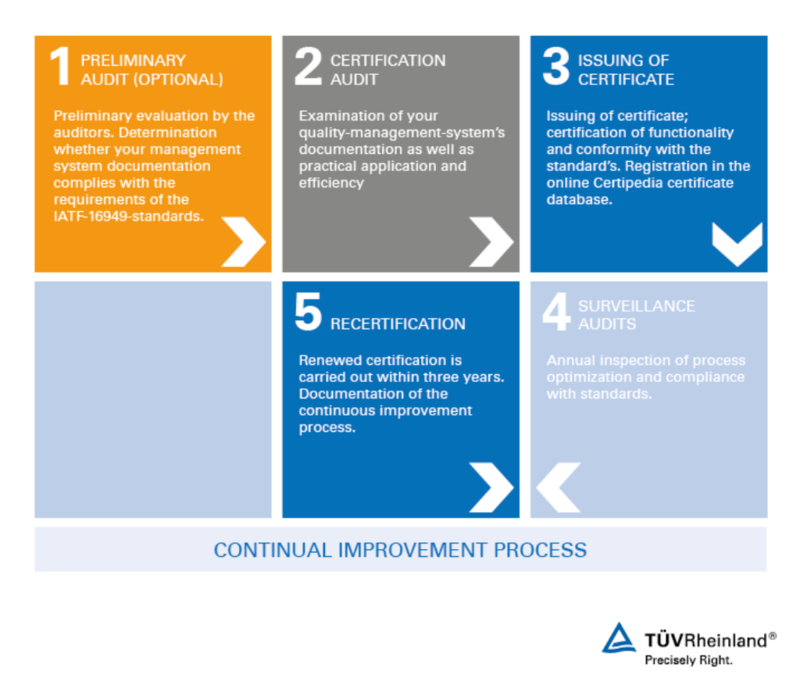 Preliminary audits offer the best possible preparation for the subsequent certification audit. Customers get to know their strengths and weaknesses at an early stage and can prepare specifically for ISO/TS 16949 certification. In the preliminary audit, our auditors conduct an assessment to determine the extent to which the processes already meet the requirements of the standard. A preliminary audit provides extra security particularly with IATF 16949 certification, in which the second stage of the certification audit may only be conducted if no significant problems were detected in the first stage (so-called readiness assessment). The audit team checks whether the documentation meets the requirements of the standard (stage 1). Our customers demonstrate the practical application of their management system in accordance with IATF 16949 (stage 2). Our auditors evaluate the effectiveness of the measures. Once all the criteria are met, the company receives the ISO/TS 16949 certificate, which certifies compliance with the specification and the reliability of the management system. In addition, your company will be recorded in our online “ Certipedia ” certificate database. Our annual monitoring audits support your organization in the continuous optimization of its processes. With recertification after three years, organizations continue their improvement process on a permanent basis and document the successful deployment of their management system in accordance with IATF 16949 for partners and customers alike. To give you an impression of the work carried out by TÜV Rheinland, we offer further information in the form of references, brochures and information sheets. What level has the quality management system in our company attained? What are the typical issues that we as a company in the automotive industry would be faced with if we opted for certification? For answers please refer to our exclusive TÜV Rheinland “online quick check for IATF 16949”.